This site is dedicated to helping I.T. professionals find out how their talents can be used in missions, or simply connecting them with other like-minded folks already in the mission field. the thing I enjoy about it is that they have IT professionals talking from experience and education about missions, TO I.T. professionals. I remember going to conferences when searching out missions and asking "how can you use a unix admin with a network background?" and I'd get glazed stares. It is nice to hear "oh, well, there are several places we have deployed servers and several people I could put you in contact with." For that purpose, it's a decent conference, and I'll tote it. 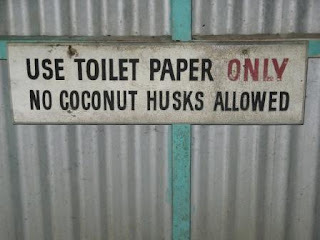 This fun photo courtesy of our friends in Alotau, PNG. If you drive across 2 bridges, and 20 minutes from here, and you arrive without incident, you could go into a new place called "Highlands Chicken" where the sign reads "Higland's Chicken" and the menu offers meals numbered from 1-20 but usually they only have 2 of those numbers at any time. If you order a 3, don't have it, a 2, no? A five? Okay a five, and wait 30 minutes you might get some food. This is our fast food, and we're actually very happy to have this option, although in it's 1 year of being open, I've been there three times, because the trek isn't worth the meal. But it's an option to us, and we like options (-; Rarely do we have an option to eat food we didn't prepare ourselves. our neighbors and friends pictured above (I'll not use their names), have been working here with the Bimin people since 1990 to bring them the Word of God, or as they call it "The Wedding Invitation of the Lamb". Standing in the front are 5 of the men what helped the man far left back, to translate the Word into their language. You can see they are holding the book, it is completed! 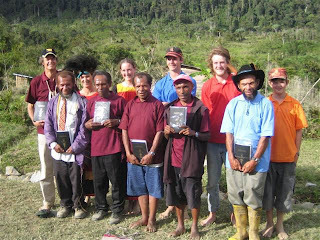 The Bible is now in the hands of the Bimin people, and we pray it revolutionizes their lives. It is a joy to be a part of this, with you. You know "one of those days" ? Last night at 11pm it started to rain and our power did a really funky thing I've never seen before, sort of a flashy, strobe effect. So I went around turning off everything. Soon my wife says "I heard a pop and now my lamp isn't working". So looked at our fuse box. Our fuse box is an old ceramic style box, and I had never changed a fuse like that. After looking for a bit I realized I needed a wire, probably special wire. Even though the paperclip is an incredibly useful invention, I decided that electricity wasn't something to be toyed with. So I thought through who I could call that would be awake at 11pm. Aha!! Soon I had new fuse wire.. POP.. POP blew them both. So it's midnight now, our fridge is off, we have no fuse wire, our security lights outside are off, running water is off and I've got to find a way to keep food from spoiling overnight. We go to sleep. I figured anything I would do at midnight would not be wise, and the food usually can keep for that long. Kendal was a bit concerned since we are having dinner guests tonight at at 8am, people were showing up to do work that required power. Not to mention, no running water since we require a water pump. So at 7am I do it again. "who do I know that is awake at 7am...aha" and soon I put in more fuse wire.. POP. So I call the electricians in, and they say "can't find a problem." well that is after they say "you have a short". but they misread the short because of the heating element in our water tank on the roof. Our Haus Meri arrived and was told she couldn't do laundry because the water was out and the machine was off. A few minutes later I find her in the kitchen with the fridge and freezer doors wide open. "Mi klinim friza" (I'm cleaning the freezer). I had to explain that we needed the fridge closed as the power was off and the food needed to stay cold as long as possible. I admired her motivation, and it turns out it wasn't an issue as the power came back on in about 10 minutes. 1. the fuse wire I was using was too low amperage and the fuse was popping. 2. there is a short in our cable to the house, that is only affected when it rains. The electricians told me if it happens again, when it rains, to let them know. Then they walked around the house banging the roof with a stick hoping to see sparks. I'm honestly hoping for #1. If it was a fuse that blew, it did it's job during that odd electrical issue. And me, being naive in the way of ancient electrical technology, used whatever my neighbors who were awake at the hour had to give. So now I know this. There are 2 gauges we use here. 10amp and 15 amp. 10amp is for the lighting. I may have been using 10amp. Someone gave me some really old rusty wire, that may have been 8amp. It was all solved I think... because the electricians used their own fuse wire and not that which I had borrowed. As I walk in I find that our servers are overheating because the airconditioning unit froze over this morning... and I wasn't here to handle the crisis... so my manager had to. It was a comedy of errors for certain. And then finally... all is calmed down and I got to check email and outlook 2003, crashes with an error. Microsoft's way of saying "life can get worse man." But if I'm honest, no matter how bad all of this seems, there is a big part of me that gets a kick out of the adventure of trying to solve it all. We all have one of those days. And the thing I'm fond of saying is "it's okay, today can be full of problems because that means tomorrow is full of solutions." I find this is true, life has ups n downs, but I also find it very comforting to know that the solution is within reach, I only have to wait. The other day we were splicing fibre optic cable, and each mistake costs us a new connector which is $22. After making 3 mistakes we thought "wow, this is going horribly wrong, let's take a break and come back tomorrow"
Sure enough the next day, we got it all spliced and working. Sometimes you simply have those days where something isn't quite working out. I personally think the trick is, to recognize that with enough time and patience it'll be resolved, and to remain calm even if your temper wants to flare. Otherwise you turn a bad day into a horrible day because of your reaction. Chuck Swindoll once said "the only thing we can control, is our attitude." Boy isn't THAT the truth. Last night my daughter told me "I prayed in front of the whole VBS today dad, it was kind of weird to pray in front of that many people." "Tok Pisin." she replied confused as to why it might be something else. My kids have recently been encouraged by me to take their faith more seriously, to talk to people about what they believe, to pray for their friends, to "show off Jesus" more than showing off themselves. Today I came home from work for lunch and saw my daughter sitting in a chair putting on "play makeup" that she got for Christmas. She was playing with her friend Natalie, who is a Papua New Guinea girl from down the road. She faced Natalie holding a glitter glue pen and said "Natalie, close your eyes"
to which Natalie quickly replied, "no", very matter of factly. It was the kind of "no" that said "I know you too well you're going to do something you shouldn't". I laughed pretty hard. You know their good friends when the girl knows my daughter so well that she knows, closing your eyes in front of Syd while she's holding pen, glue or both of the above is a very UNWISE thing to do. I think Natalie knew Sydney was plotting "new sparkly eyebrows" or something. a lot of her friendships with the PNG boys and girls revolve around her being the ring leader. She says "let's do this" and they comply, usually watching to see what the crazy white girl is going to propose. Add to that, that our children (or should I say "my" honey?) have exceptional imaginations and are often doing very odd things. So to have this little girl say "no" was not only humorous, it showed me a healthy friendship that was beyond the ... do-as-I-say-or-I-won't-be-your-friend-anymore stage. The thought occurred to me that my kids are and will be making lifetime friendships with people it'll be hard to stay in touch with during adulthood. Sydney (daughter): "Dad I don't like that you're big, because when you shake your leg at the dinner table I think it's an earthquake." Sydney : "Well I like that you're big when it comes to protectin' us n stuff though." Hello, being the holidays I assumed folks might not feel like reading very log blog entries so I've taken a break. For Christmas, the entire center here was closed on break. Since then, we've been rather busy. So the break was well enjoyed. It's been a nice kind of busy, making important decisions, doing big work. Some of these projects will be around here a long time, which is odd for technology. Most of what I work on seems urgent. And yet, in technology fields you recognize that the fruit of your labor won't live long. It has a very short life span. Working in computers is not like working in wood or stone, what I build won't be here for very long. This is why, I am so thankful that what I work on has an impact that outlasts the technology, working for God's glory and kingdom to be expanded. From time to time as I'm thinking about my job prior to coming here, I realize that being involved in giving was a way to make my labor extend into that same realm. We are so thankful for you all who labor to support us here, and in that way your work also is going towards God's kingdom as we labor together. It's a pretty neat system God set up!